The Record Pool collects data on herpetofauna (reptiles and amphibians) in the UK and to makes it available, locally and nationally, for conservation purposes. We aim to make Record Pool data as accessible as possible, whilst protecting sensitive data. You can easily add a Record Pool button or embed our sightings form on your website. Browse our publicly available data tables, export a dataset and use it for free. Access your own records and see when they have been verified by our local experts. View our new Scottish Atlas to see where amphibians and reptiles have been seen. Plot our publicly available data on a map, filter it and create your own layers. 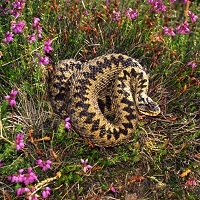 This survey encourages experienced observers to gather data in a standardised way so that information may be pooled to build a picture of trends in adder populations nationally. an exciting new citizen science project for Northern Ireland, which encourages people to record the common frogs and smooth newts they see in their school and garden ponds.